The UMass Student Farming Enterprise is a year-round class in which students manage a small organic farm and sell their produce through a CSA, farmers market, and to university and private food service and retail markets. Our farm was ranked 5th best in the nation! The UMass Permaculture Initiative is a unique class and program that has converted underused grass lawns on the campus into edible, low-maintenance, and easily replicable food gardens. To learn more follow "like" this group on Facebook. The UMass Student Food Advocacy group convinced the UMass Amherst Chancellor to make a commitment to purchasing 20% “real food” in all of the UMass Dining Commons by 2020. Students promote education, leadership and activism for a more just and sustainable food system. The Massachusetts Renaissance Center Garden is a demonstration garden open to the public, featuring herbs and vegetables grown during Shakespeare’s time. To learn more see our blog. The School Garden Project helps K-6 teachers in several local schools create and use gardens as living classrooms where students can get their hands dirty and learn lessons from nature, apply their critical thinking, math, science and other knowledge gained in the classroom. To learn more, see our blog. The UMass Food for All Garden is a student-led project that grows food for and with low-income community members. Food is distributed through Not Bread Alone and the Amherst Survival Center. See our Facebook Page. The Art Garden is a student project that is growing art materials for use by local artists.This project needs a new leader! Check it out at the blog. GardenShare is a student run garden and RSO for students with little or no gardening experience. The one acre garden is within walking distance of campus. This project helps students learn to garden and work together in a collaborative environment. The UMass Bee Keeping Club raises bees at the Agricultural Learning Center. The UMass Industrial Hemp Research Initiative is working on legislation to allow and encourage research and development of this sustainable crop. The Spiritual Ecology and Regenerative Systems group is co-creating a food forest and an herbal spiral at the UMass Agricultural Learning Center. Students are involved in trying to learn about and possibly build an "earthship". For information, contact the BioSTEAD Project. Finally, students may gain valuable experience by working with farms, non-profit organizations, government agencies and community groups. Most students in the major participate in paid or volunteer internships while earning academic credit toward the major in Sustainable Food and Farming. Some of their experiences are shared on the Student Blogs Page. If you don't see an activity that interests you in the list above, start your own! Experiential learning is the heart of this major and most students participate in internships or apprenticeships on local farms, non-profit organizations, government agencies, regiional food businesses, or may study abroad. These experiences can count toward the graduation requirements in the major. Many classes incorpoate practical experience into the syllabus. The Junior Writing class that is required of all majors for example asks students to organize an eduational outreach event for the campus or local community. Here are a few of the projects from Spring 2015. As a senior, you will be invited to participate in an optional capstone experience and join us for the annual Massachusetts Undergraduate Research Confernce. Students investigate a topic of their own interest. The range of topics explored provide an example of the diverse interests of our students. 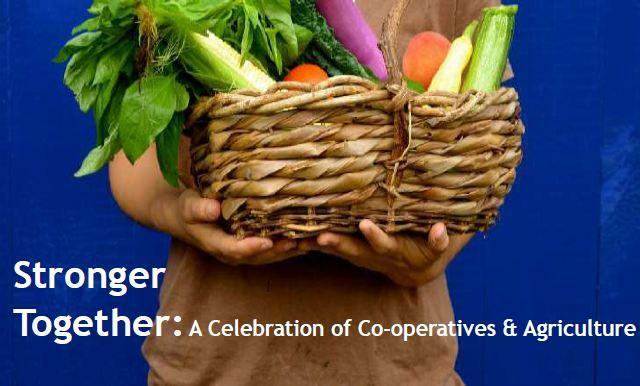 The Celebration of Food Coops was organized by our students (click on the photo to see the video).